The Day for Daniel is a National Day of Action to raise awareness of child safety, protection and harm prevention. It is about educating children and adults about keeping kids safe through child safety and protection initiatives. It aims to help empower our children to ‘Recognise, React and Report’ if they feel something is not right. Wear Red and Educate is the theme of for Day for Daniel as we strive to have schools, kindergartens, businesses and communities across Australia take action and conduct child safety activities in their local communities to help in ‘Keeping Kids Safe’. To raise awareness about child safety and protection and to promote a safer community for children. To educate children regarding their personal safety and empower them to ‘Recognise, React and Report’. and protection requirements and empower them to take action. To provide FREE safety and educational material. To honour the memory of Daniel Morcombe. 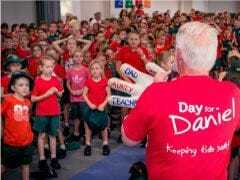 To have over 1 million people Australia Wide to participate in Day for Daniel. Day for Daniel is also an opportunity for Australians to make a statement that crimes against children are not acceptable in modern Australia.